The crucial role of chaotic effects in the dynamics of N-body gravitating systems, star clusters and galaxies, but even also of planetary systems, has became clear during the last decades. The views on the predictions on evolution of the inner Solar system has been radically modified when chaotic effects have been taken into account. Profound developments in theory of smooth dynamical systems (ergodic theory) provide efficient tools for such studies (Gurzadyan 2004). Previously we have studied the role of chaotic effects in relaxation driving mechanisms in stellar systems, and have shown that for globular clusters and galaxies the N-body interactions have crucial role as compared to two body ones. Ricci curvature criterion of relative chaos was introduced (Gurzadyan, Kocharyan 1987) which later was applied to various astrophysical systems. Considering the dynamics of clusters of galaxies as a nonlinear N-body problem, we have developed a method to solve the inverse problem of recovering of the substructure, internal dynamics and geometrical shapes of clusters of galaxies based on the redshift distribution of galaxies and the translation invariance of the distribution functions. Applying the method to the real clusters, namely to Coma and Virgo clusters, we revealed their substructure by means of S-tree technique (Gurzadyan, Mazure, 1997, 2003). The existence of main subgroups of galaxies is shown and their dynamical characteristics are estimated. Then, using the previously suggested technique (Gurzadyan, Rauzy, 1997, 2002), the bulk flow velocities of the subgroups can be evaluated for such galaxy clusters. Among the particular problems we are currently interested in is the application of Ricci curvature criterion to reveal the properties of various types of gravitating systems. The role of supermassive black holes, currently detected in a number of galaxies (including M31, M87), on the statistical properties of the surrounding stellar systems will be investigated. Such studies require development of advanced algorithms of numerical analysis of the dynamics of the systems, and estimations of the time evolution of the Ricci curvature. The properties of the Cosmic Microwave Background (CMB) radiation are a key window to our understanding of the early evolution and the present structure of the Universe. The experiments of the recent years detected the acoustic peaks in the angular power spectrum of the CMB, which are important characteristics of the conditions at the last scattering epoch, and hence constrain a number of cosmological parameters. CMB maps are also carriers of important cosmological information, particularly due to non-Gaussianity signatures. Minkowski functionals and a number of other descriptors have been already used for the study of CMB maps. 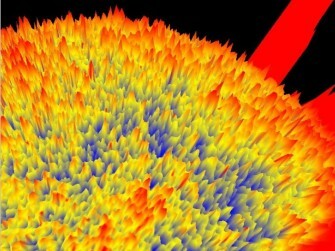 The main aim was to check the Gaussian nature of the data. Detailed numerical simulations of various geometrical descriptors have been carried out in the framework of the Planck mission. In collaboration with the team of Paolo de Bernardis of La Sapienza University we have performed an analysis of the ellipticity of the anisotropies in the sky maps of BOOMERanG, then of WMAP. At a given temperature threshold, excursion sets with temperature larger (lower) than the threshold, were identified. 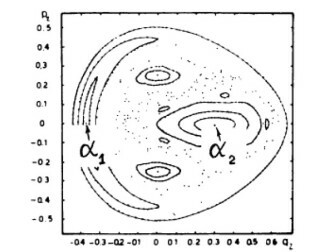 Ellipticity is expected in the CMB maps, as a result of the physical effects occurring before recombination, which induce correlations in the image of the CMB. The ellipticity analysis, which implies the estimation of Lyapunov exponents, was initiated with the aim to check the effect of geodesic mixing, which can cause additional elongation of CMB anisotropies independent on the temperature threshold. For the geodesics in hyperbolic spaces, as of Anosov systems, the scattering effectively occurs at every point of the space and in any two-dimensional directions. This is completely different from the result of gravitational lensing, the scattering on clumps of matter, which has been shown to produce a distortion of CMB spots only at sub-degree scales. The elongation of anisotropies due to the contribution of the noise, on the other hand, has to be threshold dependent. The estimation of Lyapunov exponents, Kolmogorov-Sinai (KS)-entropy and similar geometrical characteristics has proved its efficiency in the analysis and interpretation of various experimental results in a variety of fields. More informative tool for the study of the CMB maps, as we have shown, is Kolmogorov complexity, however its efficiency strongly depends on the accuracy, i.e. on the low signal-to-noise ratio. Special algorithms of study of the ellipticity in pixelized CMB maps in HEALPix representation are developed for the analysis of both the data and simulated maps. It appears that the WMAP 3 year 94 GHz (least influenced by Galactic synchrotron background, as well as by the anomalous emission of the dust) maps have properties not compatible with the simulated ones. The latter were obtained using the parameters of the power spectrum of CMB, i.e. the maps reveal properties not described by the cosmological model defining the anisotropy power spectrum. The temperature threshold independence, the horizon-scale independence and the random obliquities of anisotropies, are compatible to geodesic mixing, as an intrinsic property of geodesic flows in hyperbolic spaces. Particularly, the independence of the effect on the scale of the horizon at the last scattering surface shows that it cannot be related to the physical conditions there. Based on the idea of Zeldovich (1967), we have derived a formula (Gurzadyan, Xue 2003) for the contribution of the vacuum modes into the dark energy which leads to a negative pressure and hence to the necessary condition for the accelerated expansion of the Universe. 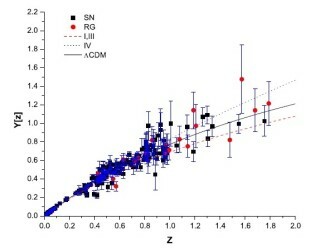 The formula for the dark energy density was obtained adopting the condition l=0 for the angular quantum number for the relevant modes of radial momentum, which implies an effective matter density about 10^(-28) g cm^(-3), that is remarkably close to the observational value. The relevance only of spherical modes can imply the Robertson-Walker metric of the Universe. This defines a set of cosmological models with quite different properties. Certain corresponding models have already been studied, and particularly, it was shown that the cosmological models defined by that formula reveal hidden symmetries. The redshift dependence of the dark energy density is studied (Djorgovski, Gurzadyan 2007).